Oh, to be in Golden, now that spring is here! For many, it’s the loveliest time of year in this pleasant valley town, that sits along the banks of pretty Clear Creek, surrounded by high rocky buttes to the east and the steep, green, evergreen-covered foothills to the west. Located only 12 miles from Colorado’s state capitol building, Golden is the first mountain town people encounter when heading west from Denver on I-70 – but it’s a mountain town with a difference. Golden sits at an elevation of just 5,675 feet. It’s in Golden that all roads start the steep climb into the Rocky Mountains, gaining elevation fast. And elevation has a huge impact on weather. But Golden can be delightful in spring with beds of tulips, beautiful smelling lilacs, pink cherry trees and wonderful walks on the Victorian backstreets of the historic village, or along the paved hiking and biking path that follows Clear Creek through the center of town. 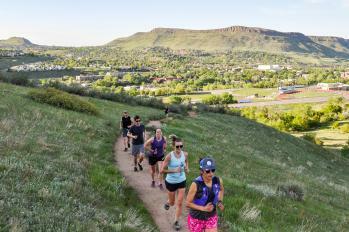 Considered by many to be one of the most beautiful walks on the Front Range, the paved trail along Clear Creek runs from the center of historic downtown Golden up into Clear Creek Canyon. Starting April 18, you can check out a FREE bike from the Golden Bike Library and pedal up and down paths along the stream, or just stroll along under a canopy of cottonwoods as the creek meanders up into the rugged canyon. There are benches, bridges and picnic tables along the way. Bring your four legged friends, since Golden is a dog-friendly kind of town. In the heart of town, there is the Golden History Park, a historic farm and homestead with buildings from the 1880s, gardens, cherry trees, and a hundred-year-old chicken coop where (if you bring some quarters) kids can feed the chickens. Long before Denver, Golden was the first capitol of the Colorado Territory. Today, the historic town’s main street is lined with old buildings that have been repurposed into chic restaurants, boutiques, coffee shops, art galleries, candy stores, toy stores and recreation outfitters selling gear for climbing, rafting, hiking, skiing, kayaking, and fly fishing. You can’t miss the 1947 welcome arch spanning Washington Avenue that has been saying “Howdy Folks!” to travelers for more than 70 years. The sign also says, “Where the West Lives,” and you’ll find that to be true in Golden’s many Western wear shops, Native American art galleries and sports stores. It’s the perfect place to sit at an outdoor café and watch the world go by. 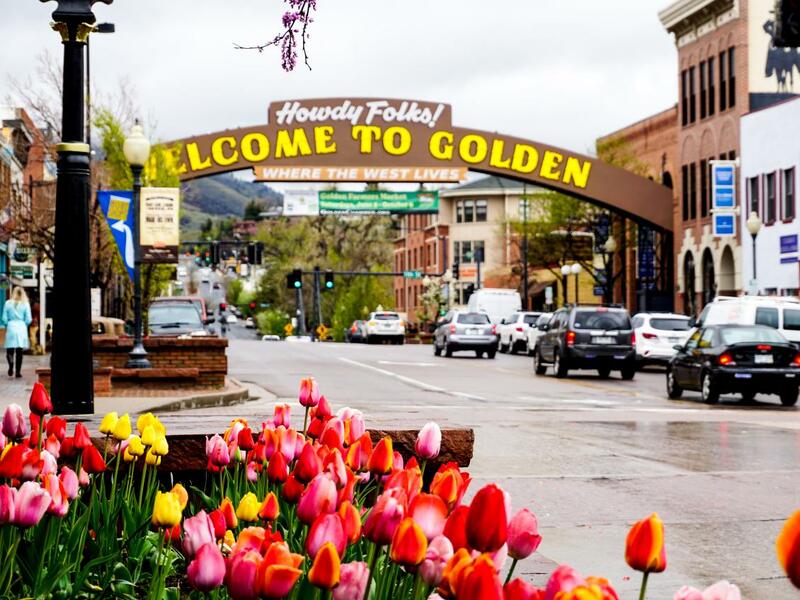 Of course, Golden is known as the “biggest little beer town in the world.” Golden produces more beer than any other city on the planet with the world’s largest brewery (Coors Brewery) and six craft breweries, each with dog-friendly outdoor beer gardens. But did you know that Golden has also become a center for craft distilled spirits? The Golden Moon Distillery, State 38 Distilling (Colorado was the 38th state), and Ski Bum Rum & Distillery have made Golden as well known for craft whiskey, gin, vodka, bourbon and rum (plus an amazing array of craft cocktails) as it is for beer. And wine lovers? Barrels & Bottles has two dozen tap and bottles of wines to match its selection of beers, many of the wines made in Color ado. And Indulge is Golden’s chic wine bar and bistro. You can climb those rocky buttes around Golden in a land once traversed by dinosaurs. The first fossilized bones of a T-REX were discovered on South Table Mountain, and a short but steep trail can take you to the summit for sweeping views. North Table Mountain is circled by a five mile trail for hiking or mountain bikes that goes up, over and around the massive rock butte. Take a detour and you can climb Lichen Peak for undisturbed views or visit an old quarry. Springtime is wonderful because the surrounding hills turn a brilliant green, and you can spot wildflowers just coming out along the trail. If you want to see more evidence of dinosaurs, try the Triceratops Trail that starts behind the free Geology Museum at the Colorado School of Mines. The trail takes you to see authentic dinosaur tracks and bones imbedded in rock, while the museum also has many dinosaur exhibits. Buffalo Bill Cody was the most famous army scout, buffalo hunter and showman in the history of the Old West, and (at his request) his grave sits in a spectacular location on top of Lookout Mountain, overlooking Golden. A museum has many of his hats, outfits, guns and posters from his exciting life, and the view from the deck is incredible, taking in everything from Pikes Peak to Rocky Mountain National Park and all the plains. You can even see the tent roof of Denver International Airport, nearly 40 miles away. You can drive to the grave site on the Lariat Loop Trail, a paved road that twists and turns with views in all directions. Or more fun, park at Windy Saddle along the Lariat Loop and hike to the grave through deep forests of conifers. 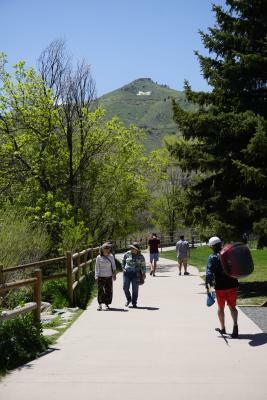 The hillsides around Golden are bright green in spring, and the lower elevation makes trails dry and generally snow free. 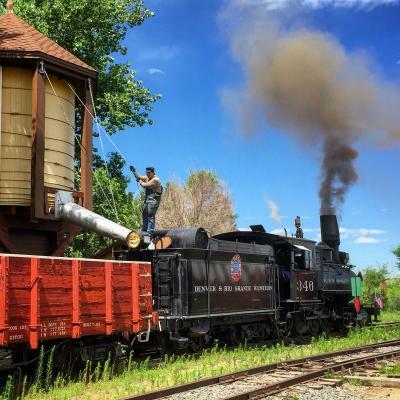 Golden is home to the largest collection of historic narrow gauge locomotives and rail cars in Colorado. One Saturday a month, the Colorado Railroad Museum fires up authentic steam locomotives that chug around a half mile circle of track; on alternative Saturdays, they run a Galloping Goose, a crazy contraption that is a bus welded on to the back of 1920s Pierce Arrow motor car that used to run on Lizard Head Pass. The museum is fun every day, with gigantic indoor and outdoor model trains and lots of cars and engines to climb aboard and ring the bell – all in a beautiful location in Clear Creek Valley surrounded by rocky buttes. Golden has the closest hotels to the world famous Red Rocks Amphitheater, which begins its summer concert series in late spring. The Origin Hotel in Golden is the official hotel of Red Rocks Amphitheatre, and Table Mountain Inn, the Golden Hotel and the Dove Inn (all in downtown Golden) are just minutes from Red Rocks parking lots or a short drive in an Uber and Lyft. 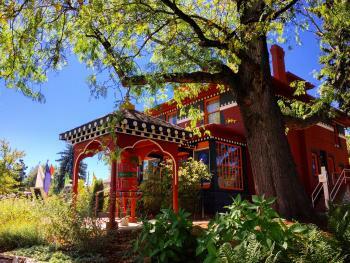 Staying in Golden adds to the one-of-a-kind Red Rocks experience since you wake up in the morning in a mountain town with possibilities for a refreshing streamside walk, bike ride, or breakfast at one of Goldens famous coffee shops and breakfast spots like the Windy Saddle Café or Sassafras. Golden is an artistic little place with lots of galleries and the Foothills Arts Center, an art museum built in an historic church that has national shows and local shows featuring area artists, photographers and craftsmen working in all mediums. The gift shop alone is worth a visit for locally made items in a beautiful room of wood, stained glass and natural light. Golden is also home to the Miners Alley Playhouse, which presents classic dramas, musicals and original productions. The theatre is located downtown, a short walk from all the village speakeasys, craft cocktail bars, breweries and restaurants, making a full night on the town something easy to do – with free parking! If you prefer to eat and drink while watching entertainment, check out the Buffalo Rose, which has been an authentic American West saloon since 1859. Their recently redone stage has state-of-the sound for a variety of local and big name national country and rock acts. DON’T JUST LOOK AT THE MOUNTAINS – LEARN ABOUT THEM! Golden is one of the major gateways to America’s largest mountain chain – the Rocky Mountains of Colorado. But it’s also considered to be one of the world’s great mountaineering centers. Downtown Golden is just minutes from technical climbing in Clear Creek Canyon and Eldorado State Park – places that attract climbers from around the planet. Both have wonderful spring hiking trails that let you get up close and personal views of these daring athletes. Golden is also home to the American Mountaineering Museum, the only museum of its kind in the nation, which has exhibits on climbing everything from Colorado’s 54 Fourteeners (peaks that climb to 14,000 feet and above) to Mount Everest and K2. If you want to learn more about Mount Everest, try dinner at The Sherpa House, an authentic re-creation of a Sherpa farmhouse in Nepal. You can have yak stew and other dishes from Nepal, while learning about these amazing people who are the best mountain climbers in the world. Want to learn how to climb yourself? Earth Treks in Golden is one of the largest indoor climbing rec centers in Colorado with classes on how to rock climb, and Bent Gate Mountaineering in Golden will provide you with all gears, ropes and shoes you need. Golden is gorgeous any time of year, but head to Golden this spring to relax and recreate. For more info, check out visitgolden.com.